Greetings comrade. When Space Race begin, imperialist Yankee running dogs spend many bazillions of dollars, making spacecraft safe, working miracles of computer engineering… Here in Mother Russia, we launch glorious representatives of people's revolution into space using rocket brought from joke shop, attach to dustbin with fins nailed to it! NASA create state-of-art, interstellar communications system… We use two tin cans and work day and night in our factories to create piece of string long enough to go from ground to space. This is why we win Space Race! Now, glorious victory in Space Race celebrated in 'Cosmonautski' exhibition at Science Museumski in your backwards UK country. Perhaps capitalist lickspittle T3.com website has review very soon - we shall see, comrade. But for now, we summarise reasons for glorious Soviet victory in easy-to-understand, 10-part list. Read on with pride comrade, but remember: in Soviet Russia, space walks on YOU! Russia is still using the same type of Soyuz spacecraft as that which first flew in 1967. Bringing home the fact that Russia won the Space Race not just in the early days but in the long term by lower-tech means, these Soyuz craft are currently the only way for U.S. astronauts to get to the International Space Station. Reason being that NASA's comparatively much newer Space Shuttle (first flight: 1981) has, of course, been phased out. The Russians favoured remote control, and didn't launch a piloted ship with an onboard guidance computer until 1980. NASA did it in 1965 on the Gemini missions. NASA's EMU spacesuit is modular and has to be put on piece by piece. Russia's Orlan comes in one piece, with astronauts simply climbing in through the back. 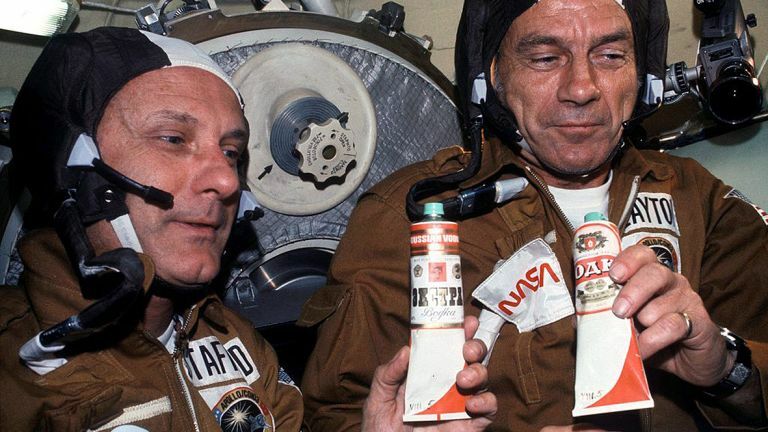 While NASA favoured freeze-dried foods in foil pouches, the Russian space programme tended to stick to old-school containers like cans and tins. 5. Who needs advanced sensors anyway? In the Soyuz, a small toy is hung from the control console. When it floats, that's how the astronauts know that they're in orbit. While NASA fitted parachutes and retro rockets to capsules for soft landings in water, the Soviets simply stuck to ejector seats and made early astronauts bail out on the way down. Furthermore, thanks to less-than-accurate navigation tech, rather than landing in a pre-planned spot in the ocean, early cosmonauts landed in the Russian wilderness, where they sometimes had to survive for days on end, until being rescued by the army, or even local farmers, as happened to Yuri Gagarin. Engineering errors leading up to the very first spacewalk meant that cosmonaut Alexey Leonov saw his spacesuit balloon like a tin foil Michelin man. He only survived by breaking protocol and opening a valve to let some air out. While Ham the chimp returned safely to Earth after an early NASA test flight, the Soviets had not yet developed the tech to de-orbit safely. As a result, iconic but unlucky space dog Laika was never expected to survive, although it does live on as this cute toy, available at the Science Museum gift shop. The tiny Voshkod 1 capsule left no room to wear spacesuits, so the smallest leak would have killed the crew. The solution was to send an engineer up as a cosmonaut, not so much to fix things as to reassure the other two. …Aaaand then there's the story about NASA spending thousands, or millions or maybe even billions of dollars, engineering an incredibly high-tech pen that worked in zero G, while the Russians just used a pencil. That's not strictly true. In fact it's not even remotely true. The Fisher Pen Co paid for, developed (and subsequently cannily marketed) its AG-7 “Space Pen”, and only then sold some to NASA at the usual kind of price that you'd pay for a posh pen. Still, it works as a metaphor, so we'll let it go.